The Boy Scouts of America, which was expected to announce today a decision regarding their controversial ban on gay and lesbian members, instead said a decision won't come until May at the earliest. Facing pressure from many scouts and parents across the country to end the 100-year-old policy, the BSA Executive Board was expected to potentially repeal it, leaving the decision up to individual troops. But the call will now be left up to the National Council - made up of about 1,400 members - who will wait until their May meeting to vote on the ban. "After careful consideration and extensive dialogue within the Scouting family, along with comments from those outside the organization, the volunteer officers of the Boy Scouts of America's National Executive Board concluded that due to the complexity of this issue, the organization needs time for a more deliberate review of its membership policy," the BSA said in a statement on their website. Over the weekend, President Obama expressed his hope that the board would lift the ban today. "My attitude is that gays and lesbians should have access and opportunities, the same way as everyone else does, in every institution and walk of life," Obama told CBS' Scott Pelley in an interview aired before the Super Bowl. "And you know the Scouts are a great institution, that are promoting young people and exposing them to opportunities and leadership that will serve people for the rest of their lives. And I think nobody should be barred from that." Herndon Graddick, president of the gay advocacy group GLAAD, saw the decision to delay as a snub to gay young people and parents. "An organization that serves youth and chooses to intentionally hurt dedicated young people and hardworking parents not only flies in the face of American principles, but the principles of being a Boy Scout," Graddick said in a statement emailed to ABC News. "The Boy Scouts of America is choosing to ignore the cries of millions, including religious institutions, current scouting families, and corporate sponsors, but these cries will not be silenced. We're living in a culture where hurting young gay people because of who they [are] is unpopular and discriminatory." The Scouts have faced the exit of some corporate sponsors and opposition from parents and scouts in light of the ban over the past year. 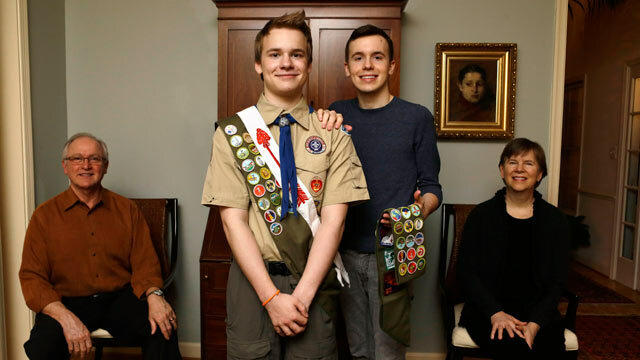 Jennifer Tyrrell, the den leader who took her 7-year-old son, Cruz, out of scouting after she was "fired" by her local Cub Scout troop for being gay, started a petition to change the policy for her on change.org that has received 338,846 signatures since she posted it in the spring. She was very emotional about today's announcement telling ABC News she "couldn't stop crying" after she heard the news. "A scout is supposed to be brave, and the Boy Scouts failed to be brave today," Tyrrell said of the Council's delay. "The Boy Scouts had the chance to help countless young people and devoted parents, but they've failed us yet again." "This isn't just about politics for me. This is my life that they get to vote on. This is the life of so many people," Tyrrell added, saying she worried for the well-being of Scouts who may not yet have come out as gay. Over the next three months, committees are expected to gather feedback from those involved with scouting about the issue. On Thursday, the BSA posted their contact information and a request for feedback to their Facebook page. In five days, the post received almost 5,200 comments. Another post from a few days before with a link to the membership policy received almost 23,000 comments in just over a week. The comments ranged from former scouts asking the organization to uphold its rule to Den Mothers begging BSA to include all boys. A poll released by Quinnipiac University Wednesday said 55 percent of American voters would support the BSA dropping its ban, whereas 33 percent would want to preserve it. Women supported its repeal 61 to 27 percent. For men, the decision was tighter with 49 percent advocating for gay scouts and 39 percent opposing them. A Gallup/USA Today poll conducted in December that asked specifically about allowing gay and lesbian adults to serve as scout leaders found 52 percent opposed the idea.